India’s endemic gender-based violence has received increased international scrutiny and provoked waves of domestic protest and activism. In recent years, related studies on India and South Asia have proliferated but their analyses often fail to identify why violence flourishes. Unwilling to simply accept patriarchy as the answer, Tamsin Bradley presents new research examining how different groups in India conceptualise violence against women, revealing beliefs around religion, caste and gender that render aggression socially acceptable. She also analyses the role that neoliberalism, and its corollary consumerism, play in reducing women to commodity objects for barter or exchange. Unpacking varied conservative, liberal and neoliberal ideologies active in India today, Bradley argues that they can converge unexpectedly to normalise violence against women. Due to these complex and overlapping factors, rates of violence against women in India have actually increased despite decades of feminist campaigning. This book will be crucial to those studying Indian gender politics and violence, but also presents new data and methodologies which have practical implications for researchers and policymakers worldwide. Bruno De Nicola investigates the development of women’s status in the Mongol Empire from its original homeland in Mongolia up to the end of the Ilkhanate of Iran in 1335. Taking a thematic approach, the chapters show a coherent progression of this development and contextualise the evolution of the role of women in medieval Mongol society. The arrangement serves as a starting point from where to draw comparison with the status of Mongol women in the later period. Exploring patterns of continuity and transformation in the status of these women in different periods of the Mongol Empire as it expanded westwards into the Islamic world, the book offers a view on the transformation of a nomadic-shamanist society from its original homeland in Mongolia to its settlement in the mostly sedentary-Muslim Iran in the mid-13th century. During the uprisings of late 2010 and 2011 which took place across the Middle East and North Africa, women made up an important part of the crowds protesting. Women’s rights were central to the demands made. However, despite this, in the ensuing social and political struggles, these rights have not progressed much beyond the situation under previous governments. Hiam El-Gousi’s book offers an examination of the status of women under Egypt’s various authoritarian regimes. In exploring the role played by religious scholars in helping to define women’s status in society, she focuses on personal status laws and health rights. In examining the issue of women’s rights El-Gousi begins with an account of feminism in Egypt: the centre of feminist thought in the Middle East at the end of the nineteenth and beginning of the twentieth century. Based on extensive research in the country, especially at grassroots level, El-Gousi goes on to analyse the constitutional and legislative rulings which have affected the lives and rights of Egyptian women. This book will become a vital primary resource for those studying feminism in the wider Middle East and North Africa. The politics of the hijab and burqa lie at the intersection of the political and legal spheres. Consequently, the political and legal spheres have each attempted to enforce differing versions of the concepts of equality and neutrality. A cross-cultural and cross-national survey of judicial decisions and legislative action in these countries demonstrates how each is balancing individual rights and communal bonds, and adhering to or retreating from previously accepted human rights norms for women and religious practices. The three Abrahamic faiths have dominated religious conversations for millennia but the relations between state and religion are in a constant state of flux. This relationship may be configured in a number of ways. Religious norms may be enforced by the state as part of a regime of personal law or, conversely, religious norms may be formally relegated to the private sphere but can be brought into the legal realm through the private acts of individuals. Enhanced recognition of religious tribunals or religious doctrines by civil courts may create a hybrid of these two models. One of the major issues in the reconciliation of changing civic ideals with religious tenets is gender equality, and this is an ongoing challenge in both domestic and international affairs. Examining this conflict within the context of a range of issues including marriage and divorce, violence against women and children, and women’s political participation, this collection brings together a discussion of the Abrahamic religions to examine the role of religion in the struggle for women’s equality around the world. The book encompasses both theory and practical examples of how law can be used to negotiate between claims for gender equality and the right to religion. It engages with international and regional human rights norms and also national considerations within countries. Women in New Religions offers an engaging look at women’s evolving place in the birth and development of new religious movements. It focuses on four disparate new religions—Mormonism, Seventh-day Adventism, The Family International, and Wicca—to illuminate their implications for gender socialization, religious leadership and participation, sexuality, and family ideals. Religious worldviews and gender roles interact with one another in complicated ways. This is especially true within new religions, which frequently set roles for women in ways that help the movements to define their boundaries in relation to the wider society. As new religious movements emerge, they often position themselves in opposition to dominant society and concomitantly assert alternative roles for women. But these religions are not monolithic: rather than defining gender in rigid and repressive terms, new religions sometimes offer possibilities to women that are not otherwise available. Vance traces expectations for women as the religions emerge, and transformation of possibilities and responsibilities for women as they mature. Weaving theory with examination of each movement’s origins, history, and beliefs and practices, this text contextualizes and situates ideals for women in new religions. The book offers an accessible analysis of the complex factors that influence gender ideology and its evolution in new religious movements, including the movements’ origins, charismatic leadership and routinization, theology and doctrine, and socio-historical contexts. It shows how religions shape definitions of women’s place in a way that is informed by response to social context, group boundaries, and identity. Women and Religious Traditions uses a critical feminist lens to explore the roles and interactions of women with major world faith traditions. Within each particular tradition, the text examines the history and status of women, family structures, sexuality, and social change, as well as texts, rituals, and interpretations by and for women. Thirteen experts contribute nine chapters and five case studies, including a new case study on women in Chinese traditions. This third edition builds on the strengths of the first two, with the addition of lived religion content in each chapter, an expanded introduction to the study of women and religion, new research on Buddhist nuns, and up-to-date material on women’s current political position in Islamic countries. This book explores how medieval and modern Muslim religious scholars (‘ulamā’) interpret gender roles in Qur’ānic verses on legal testimony, marriage, and human creation. Citing these verses, medieval scholars developed increasingly complex laws and interpretations upholding a male-dominated gender hierarchy; aspects of their interpretations influence religious norms and state laws in Muslim-majority countries today, yet other aspects have been discarded entirely. Karen Bauer traces the evolution of their interpretations, showing how they have been adopted, adapted, rejected, or replaced over time, by comparing the Qur’ān with a wide range of Qur’ānic commentaries and interviews with prominent religious scholars from Iran and Syria. At times, tradition is modified in unexpected ways: learned women argue against gender equality, or Grand Ayatollahs reject sayings of the Prophet, citing science instead. This innovative and engaging study highlights the effects of social and intellectual contexts on the formation of tradition, and on modern responses to it. The visible increase in religious practice among young European-born Muslims has provoked public anxiety. New government regulations seek not only to restrict Islamic practices within the public sphere, but also to shape Muslims’, and especially women’s, personal conduct. Pious Practice and Secular Constraints chronicles the everyday ethical struggles of women active in orthodox and socially conservative Islamic revival circles as they are torn between their quest for a pious lifestyle and their aspirations to counter negative representations of Muslims within the mainstream society. Jeanette S. Jouili conducted fieldwork in France and Germany to investigate how pious Muslim women grapple with religious expression: for example, when to wear a headscarf, where to pray throughout the day, and how to maintain modest interactions between men and women. Her analysis stresses the various ethical dilemmas the women confronted in negotiating these religious duties within a secular public sphere. In conversation with Islamic and Western thinkers, Jouili teases out the important ethical-political implications of these struggles, ultimately arguing that Muslim moral agency, surprisingly reinvigorated rather than hampered by the increasingly hostile climate in Europe, encourages us to think about the contribution of non-secular civic virtues for shaping a pluralist Europe. 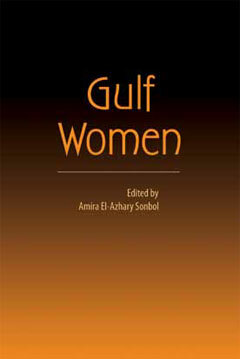 Last fall, Syracuse University Press published Gulf Women (2012) edited by Amira El-Azhary Sonbol (Georgetown University). The publisher’s description follows. This groundbreaking collection of essays provides a greater understanding of the history of the Gulf and the Arab world and is of relevance to Muslim women everywhere. Featuring research never published before, Gulf Women is the result of a project aimed at finding sources and studying the history of women in the region. The chapters cover ancient history and the medieval, early modern, and contemporary periods. Presenting discourses on the life of women in early Islam, women’s work and the diversity of their economic contribution, the family—and how it changed over time—as well as the legal system and laws dealing with women and family from the pre-modern to the modern periods, this is a pioneering collection by leading scholars from Arab and international universities.